American musician will.i.am was among the 75,000-strong crowd at the Allianz Arena for Bayern Munich’s Bundesliga Matchday 3 clash against Bayer Leverkusen on Saturday. One of the founding members of the Black Eyed Peas, will.i.am, whose birth name is William James Adams Jr., has been travelling around Europe with the band to promote Masters of the Sun – their first studio album in eight years. "I always come to Munich and see the stadium," he told bundesliga.com afterwards. "I've always dreamed of playing [a concert] in the stadium, so after coming here my dreams of playing here are even bigger. Being a part of this; being in the crowd when Bayern were playing, to see James [Rodriguez] play and score a goal… shows you just how awesome he is as a player. The team, the offence and defence was superb, the fans, the energy the love." 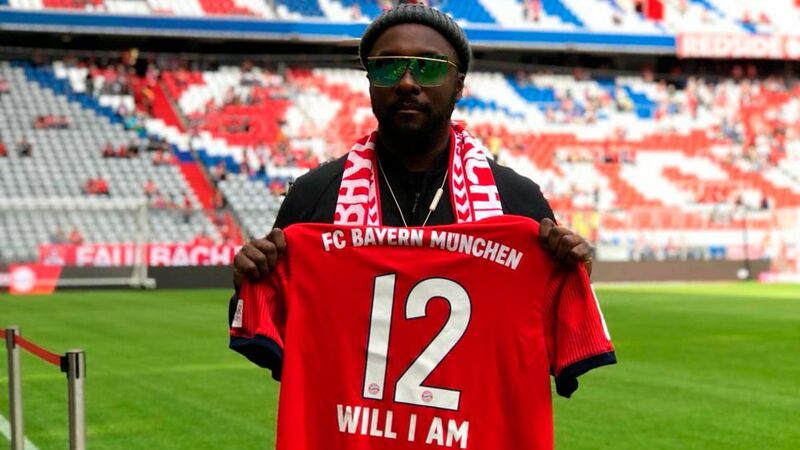 will.i.am is the latest in a long line of celebrity A-listers to have watched the German record champions recently, with Arnold Schwarzenegger, Angela Merkel, Imagine Dragons and Deadpool actor Ryan Reynolds all paying a visit to the Allianz Arena over the last 24 months.